Printed on PVC, Polypropylene, Paper, and other types of self-adhesive tapes, including food & flower bundling tapes. 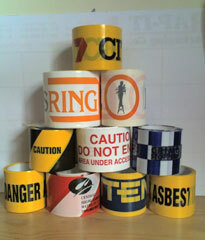 These tapes are used to secure, to promote, to identify, to warn, to decorate, and to highlight. From 12mm to 192mm in width, in both hand held and machine length rolls, we are able to print up to 3 ink colours (not counting the tape colour). 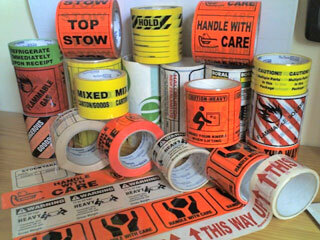 We can supply the tape in all the popular standard colours. Minimum print run is one carton. RipStick labels are a printed tape that have been laminated and perforated to produce a label on a roll. From 18mm to 192mm in width and from 29mm to 344mm in length, we are able to print up to 3 ink colours (not counting the tape colour). 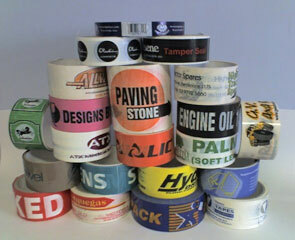 We can supply the tape in all the popular standard colours. Minimum production run is one carton. Barrier films are used for the warning of dangerous situations, to cordon off areas, for promotions, to identify, and to decorate areas. From 24mm to 192mm in width, in lengths of up to 500m, we are able to print up to 3 ink colours (not counting the film colour). Standard film colours are Clear, White & Yellow, other colours are available, but larger print quantities would apply. Minimum production run depends on the chosen base colour film but as always, is not excessive.